Dr. David Howard received his Ph.D. from the University of British Columbia in Art History in 1993 and also holds degrees both in Canadian History as well as Fine Arts (Painting). He has published numerous book chapters, articles, and reviews on the history, politics, and theory of modernism and postmodernism in the United States and Canada after World War II. David has also curated a critical retrospective of the work of the Canadian abstract painter Art McKay. His current research examines the complex phenomena of allegory in European and North American culture, especially in the writings of Charles Baudelaire, Walter Benjamin, and Craig Owens, as a key instrument for cultural and social critique in the twenty-first century. The triptych of works, entitled simply Three Houses, is a small sample of my scholarly research into the relationship between image and text that has been the focal point of much critical and poetic experimentation in the Western art world over the last 150 years. The work foregrounds the use of quotations by authors from a diverse range of sources, ranging from children’s story books, poetry, short stories, and novels, up to the latest advances in critical theory, juxtaposing these quotations with a large array of art historical and mass media imagery. This allegorical technique deliberately emphasizes citation, appropriation, copying, and reproduction, as a means of calling into question the artificiality of the concept of originality and traditional notions of authorial voice. My intent was to create a radical form of poetry/art that could function both in the world of academia, as scholarship, and in the worlds of art and poetry simultaneously. Since beginning the project seven years ago, or over 33 years ago, if you include my first attempt as a young BFA student, the work has appeared in academic journals and poetry publications in Europe, the United States, and Australia. The first book using the technique, The Day of the Dogs, is now available on-line and I am currently working on a book-length manuscript, using this allegorical technique of writing, on the topic of utopia. Modern and Contemporary Art Theory and Criticism. The Inaugural Creative Practice and Research Grant Award, Awarded by NSCAD University, 2008. The Inaugural Student Union of the Nova Scotia College of Art and Design University Faculty Recognition Award 2002 (for outstanding teaching performance and dedication to improving the quality of student life). The Day of the Dogs. Santa Maria, CA: Differentia Press, 2013. Gnawing on Skulls: Allegory in the Age of the American Empire Volume I. (completed). Published as a series of articles. The Golgotha Hole: Allegory in the Age of the American Empire Volume II. (completed) . In the process of being published as a series of articles. “Halo of Flies: Allegorical Poetics and Excremental Theology,” (from the Introduction to The Golgotha Hole: Allegory in the Age of the American Empire, Volume II), Left Curve. Number 37. “What’s My Name? : Memory, Identity, and Allegory in the Age of the American Empire,” American, British, and Canadian Studies, Vol. 19, December 2012: 124-156. “Arson/Art: A Manifesto,” American, British, and Canadian Studies, Vol. 19, December 2012: 157-162. (also includes own original digital photography). 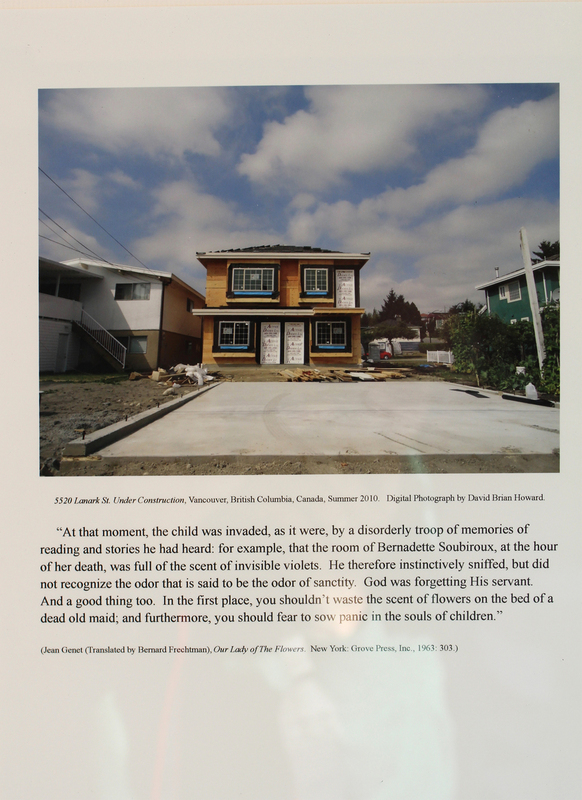 “Mourning and Memory.” Counterexample Poetics, Accepted for Publication, June 2013. Submitted: “Intersections,” quarterafter, Fall 2012. Submitted: “Utopia.” Platypus Review, Fall 2012.
Review of John Holloway, Fernando Matamoros & Sergio Tischler (Editors), Negativity & Revolution: Adorno and Political Activism. Puebla: Pluto Press, 2009, submitted to The Platypus Review, July 2012. Submitted: “Locating the Capital of the Ruins/Between Chesed and Binah,” Politics and Culture. “The Infernal Machine,” Counterexample Poetics, Published on-line, June, 4, 2012. “The Mark Twain Fragments,” Counterexample Poetics. Published on-line, May, 12, 2012. “Progress in an Age of Rigor Mortis? : Canada’s Expo ’67 and the Triumph of American Liberalism,” in Left Curve. Number 36: 155-142. “Arson/Art: A Manifesto.” Exhibited in the Eyelevel Gallery Exhibition ERI5: The Resistance to Change. Co-edited Special Issue of The Journal of American, British, and Canadian Studies on the topic of “Post-Racial Americas: Cultural Studies in the Age of Barack Obama. Volume 16, July, 2011. “Torrid Zone: Fragments,” in June 16, 2011, Counterexample Poetics. “Pelado,” in Left Curve. Number 35, (Spring 2011): 121-130. “Modernism’s First and Last Post: The Critical Demise of Clement Greenberg’s ‘Post Painterly Abstraction’ Exhibition in Lost Angeles,” The Journal of American, British, and Canadian Studies. Volume 15, (December 2010): 26-46.
Review of Lambert Zuidervaart, Social Philosophy after Adorno. Cambridge: Cambridge University Press, 2007: Politics and Culure, Issue 4, 2009.
Review of Allan Antliff, Anarchy and Art: from the Paris Commune to the Fall of the Berlin Wall. Vancouver: Arsenal Pulp Press, 2007: University of Toronto Quarterly. Volume 78, Number 1, Winter, 2009. “Cultural Strategy in the Golden Age of Terror: The Relationship of the 1964 New York World’s Fair to the New Frontier and the Cold War,” American, British, and Canadian Studies. Volume 10, 2007.
Review of Tim Beasley-Murray, Mikhail Bakhtin and Walter Benjamin: Experience and Form. New York: Palgrave MacMillan, 2007 inTopia. Number 120, Fall 2008.
Review of Jonathan Harris, Criticism, Meaning, and Interpretation after Postmodernity. Liverpool: Liverpool University Press: 2008, in the Art Book, Volume 15, Issue 3, August 2008: 32-33.
Review of David Jenneman, Adorno in America. Minneapolis: University of Minnesota Press, 2007 in the Journal of American Culture, Volume 31, Number 1, March 2008: 102-104.
Review of Alex Thomson, Adorno: A Guide for the Perplexed. Continuum Publishing Group, in the Dalhousie Review: 459-461, 2008.
Review of Alexander John Watson, Marginal Man: The Dark Vision of Harold Innis. American, British, and Canadian Studies, 2008. “Making Space for Clay? : Ceramics, Regionalism and Postmodernism in Regina” in Sandra Alfoldy (ed. ), Neo-Craft: Modernity and the Crafts. Halifax: NSCAD University, 2007. Re-publication of “From the Missile Gap to the Culture Gap: Modernism in the Fallout from Sputnik” in Michael Ryan (ed. ), Cultural Studies: An Anthology. Oxford: Blackwell Publishers, 2008. Co-editor of special issue of the Canadian Review of American Studies on the theme of “America and Violence”. Volume 38, Number 1, 2008. “Modernism’s Last Post: Clement Greenberg and the Critical Demise of the 'Post-Painterly Abstraction' Exhibition” for a edited volume that is being assembled by Brian Foss of Concordia University (University of Ottawa Press). Review of Jonathan Loesberg, A Return to Aesthetics: Autonomy: Indifference, and Postmodernism. Stanford: Stanford University Press, 2005 in Modernism/Modernity Vol. 14 No.1 Jan. 2007: 182-184.
Review of S. Brent Plate, Walter Benjamin, Religion, and Aesthetics: Rethinking Religion Through the Arts. New York: Routledge Press, 2005 inJournal of the American Academy of Religion Vol. 74 No. 2 June 2006: 560-1.
Review of Shane Gunster, Capitalizing on Culture: Critical Theory for Cultural Studies. Toronto: University of Toronto Press, 2004 in American, British and Canadian Studies. Review of Richared J. Lane, Reading Walter Benjamin: Writing Through the Catastrophe. Manchester and New York: Manchester University Press, 2005 in Dalhousie Review 86:1 Spring 2006: 153-154.
Review of Jonathan Harris, Writing Back to Modern Art After Greenberg, Fried, and Clark. New York: Routledge Press, 2005 in Journal of American Culture 29:3, Sept. 2006: 393.
Review of Margaret Dikovitskaya, Visual Culture: The Study of the Visual after the Cultural Turn. Cambridge and London: MIT Press, 2005 in the Art Book Vol. 14 Feb. 2007: 48-49.
Review of Espen Hammer, Adorno and the Political. New York: Routledge, 2006 in Politics and Culture Issue 2 2007.
Review of Todd Gitlin, The Intellectuals and the Flag. New York: Columbia University Press, 2006 in American-Studies Today On-Line 15 Sept. 2006: 40.
Review of Marcie Frank, How to Be An Intellectual in the Age of TV: The Lessons of Gore Vidal. Durham and London: Duke University Press, 2005 in Topia 16 Fall 2006: 169-170.
Review of Stephen Harris, Surrealist Art and Thought in the 1930s: Art, Politics, and the Psyche Cambridge: Cambridge University Press, 2004 in Politics and Culture. Issue 3, 2005. “Between Avant-Garde and Kitsch: Pragmatic Liberalism, Public Arts Funding, and the Cold War,” in C.A. van Minnen and S. Hilton (eds. ), Frontiers and Boundaries in U.S. History. “Between Avant-Garde and Kitsch: Pragmatic Liberalism, Public Arts Funding, and the Cold War,” in Canadian Review of American Studies. Review of Frederic Jameson, A Singular Modernity: Essays on the Ontology of the Present in Comparative American Studies June, 2004.
Review Essay of Frances K. Pohl, Framing America: A Social History of American Art. New York: Thames and Hudson, 2002 in American Quarterly Volume 56, Number 2, 2004: 421-428. “Critique in an Age of Rigor Mortis: Negative Dialectics, Symmetrical Logic, and Terrorism after September 11, 2001,” in The Canadian Review of American Studies 33, no.2, 2003: 109-117.
Review of Giovanna Borradori, Philosophy in a Time of Terror: Dialogues with Jurgen Habermas and Jacques DerridaChicago: University of Chicago Press, 2003 in Dalhousie Review 83.3 Autumn 2003: 455-457.
Review of Hal Foster, Design and Crime (And Other Diatribes) London: Verso, 2002 in Cultural Critique 54 Spring 2003: 245-249.
Review of Lynda Jessup (ed. ), Antimodernism and Artistic Experience: Policing the Boundaries of Modernity Toronto: University of Toronto Press, 2001 in Modernism/Modernity Volume Nine, Number Three, September 2002: 525-526.
Review of John O’Brian, Naomi Sawada, and Scott Watson(eds. ), All Amazed for Roy Kiyooka Vancouver: Arsenal Press, 2002 in B.C. Quarterly. Review of Peter Paret, German Encounters with Modernism, 1840-1945 Cambridge: Cambridge University Press, 2001 in the Canadian Journal of History/ Annales canadiennes d’histoire XXXVII, August 2002: 373-375.
Review Essay of Antonio Negri and Michael Hardt, Empire. Cambridge: Harvard University Press, 2000 inThe Canadian Review of American Studies 31, no.1, 2001: 495-500. “Culturing the Masses: State Patronage of the Arts and the Cold War in the United States,” in Gustavo Curiel, Patrocino, Colecion Y Circulacion De Las Artes. Universidad Nacional Autonoma De Mexico and the Instituto De Investigaciones Esteticas: Mexico, 1997: 367-389. Art McKay: A Critical Retrospective Exhibition Catalogue, Norman Mackenzie Art Gallery: Regina, 1997. “From the Missile Gap to the Culture Gap: Modernism in the Fallout from Sputnik,” in Christopher Geist (ed.) Writing on the Cloud: American Culture Confronts the Atomic Bomb. University Press of America: Boston, 1997: 61-72. “Back To School,” Canadian Art 13 (Fall 1996): 45-56. “From Colonial Space to the 'Global Village': U.S. Foreign Policy and the Construction of Canadian Identity at Expo ’67,” inOscar Olea, Arte Y Espacio. Universidad Nacional Autonoma de Mexico, Instituto de Investigaciones Esteticas: Mexico, 1996: 105-122. “Modernism on the Margins: Clement Greenberg’s 'Safari' to Western Canada in 1962,” in Gustavo Curiel, Renato Gonzalez Mello and Juana Guttierrez Haces (eds. ), Arte, Historia E Identidad en America: Visiones Comparativas. Tomo III, Universidad De Mexico, Intituto De Investigaciones Esteticas: Mexico, 1994: 841-856. “From Emma Lake to Los Angeles: Modernism on the Margins,” The Flat Side of the Landscape: The Emma Lake Artists Workshops. Exhibition Catalogue, Mendel Art Gallery: Saskatoon, 1989: 41-51. Chair, Historical and Critical Studies Division, Fall 2006 - Summer 2009. Academic Council, Winter Semester, 1997 and Fall 2006 - Summer 2009. Vice-President Faculty Association of the Nova Scotia College of Art and Design University, 2000-2006. Board of Governors, Nova Scotia College of Art and Design University, 2006-2008. Board of Governors, Nova Scotia College of Art and Design, 1995 – 1997 as well as serving on the Executive Committee of Board, 1996 and 1997. Nova Scotia College of Art and Design University Representative, Canadian Association of University Teachers (CAUT), 1992 - 1994. Interim Head of the Art History Department, Nova Scotia College of Art and Design University, Winter Semester, 1997. Appointed Associate Editor of The Journal of American, British, and Canadian Studies. (2015 onwards). Currently on the Dissertation Committee of Danen Poley. Currently: Advising Julia Fleur McMillan. SSHRC Granting Proposal for the Conference “America and Violence” submitted. Co-Chair and Treasurer of the Organizing Committee for the Conference “America and Violence” being held at the Delta Barrington Hotel, Halifax, Nova Scotia, Oct. 6-9. 2005. “Making Space for Clay? : Ceramics, Regionalism, and Postmodernism in Regina,” presented at Neo-Craft: Modernity and the Crafts, Novemeber 23-25, 2007: Halifax, Nova Scotia. “The Transparent Empire” College Art Association, Atlanta, Georgia, 2005. “Modernism’s Last Post: Clement Greenberg and the Critical Demise of the ‘Post Painterly Abstraction’ Exhibition,” presented at the British Association of American Studies Annual Conference, April 15-18, 2004, Manchester, England. “Between Avant-Garde and Kitsch: Pragmatic Liberalism, Public Arts Funding, and the Cold War,” presented at the Sixth Middleburg Conference of European Historians of the United States, Roosevelt Study Center, The Netherlands: April 23-25, 2003. “Between Avant-Garde and Kitsch: Pragmatic Liberalism, Public Arts Funding, and the Cold War,” presented at the Canadian Association for American Studies Annual Meeting entitled, “National Identity and Cultural Production,” Toronto, Ontario: Fall 2002. "Plop! Goes the World: A Critical Re-Assessment of the Sixties." University of British Columbia, October 12-14, 1999. The American Comparative Literature Association, Annual Meeting, held October 14 - 18, 1998, Montreal, Quebec. The Canadian Association for American Studies, Annual Meeting, held October 14 - 18, 1998, Banff, Alberta. The Association for Canadian Studies in the United States, "In Canada:// Modern at the Margin" held June 26 - 27, 1998, Halifax, Nova Scotia. Annual General Meeting of the New England Historical Association, Amherst College, Massachussetts, April 1996. The Twentieth International Colloquium on Art History, Instituto De Investigaciones Esteticas, Universidad Nacional Autonoma De Mexico, held in Puebla, Mexico, October, 1996. The Nineteenth International Colloquium on Art History, Insituto De Investigaciones Esteticas, Universidad Nacional Autonoma De Mexico, held in Mexico City, October 1995. "The Atomic Age Opens: American Culture Confronts the Atomic Bomb" Bowling Green University, Bowling Green, Ohio, July 1995. "Borders and Bonds: Society and Customs in a World of Regions" American Studies Association Annual Meeting, Nashville, Tennessee, October 1994. Seventeenth International Collquiam on Art History, Insituto De Investigaciones Esteticas, Universidad Nacional Autonoma De Mexico, held in Zacatecas, Mexico, September, 1993. The Annual General Meeting of the U.A.A.C., Victoria, British Columbia, November, 1993. Learned Societies Conference, McMaster University, Hamilton, Ontario, May 1987. 2008 Push the Envelope, Anna Leonowens Art Gallery, NSCAD University as part of the series of exhibitions and lectures entitled, Where Have all the Radicals Gone?